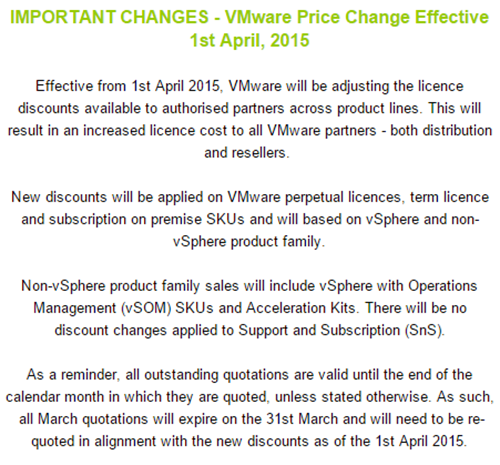 VMware has almost certainly increased the prices it charges to partners and customers. News of the increases is dribbling out after Virtzilla wrote to users and resellers over the last few days. In this Reddit thread VMware users report price hikes of between one and five per cent. That's not a denial, and with a few sources out there reporting receipt of price rise letters, saying there's no price rise in the wind probably isn't possible. Whatever VMware's up to, those who've been told prices are rising aren't rabid: folks in the Reddit thread feel that VMware has added a decent lot of new features. Which is a fair argument. vSphere 6.0 is a big step forward, and customers can now also get a free OpenStack distribution from VMware.